We at Amino Z believe that knowledge is power. This is especially true when you are trying to take care of your body. Acquiring more knowledge about fitness, nutrition, rest and supplementation will help you take that all-important first step in reshaping your body and your life! 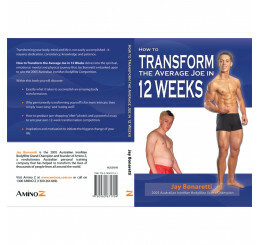 Spearheading this impressive line-up is Amino Z owner Jay Bonaretti's Book ''How To Transform The Average Joe In 12 Weeks!'' Jay's book delves into the spiritual, emotional, mental and physical journey he embarked upon to win the 2005 Australian Iron Man Body Blitz Competition. - ''Body Confidence: Venice Nutrition's 3-step System That Unlocks Your Body's Full Potential'' by Mark MacDonald. Hurry and order yours today!